The word Kunstkammer comes from the German words Kunst meaning “art” and Kammer meaning “a chamber” or “a room”. The building of the Kunstkammer is one of a few survived monuments of the Russian Baroque. Its con­struction started in 1718 by the architects Georg Mattarnovi, Nikolay Gerbel and Gaetano Quiaveri and was completed by Mikhail Zemtsov in 1734. The facade of the building is divided into three parts and the parts are linked by a multi-tiered tower. The upper part of the building was destroyed by fire in 1747 and restored between 1948 and 1949. The building was returned to its original appearance. First, the private Collections of Peter the Great were exhibited in this building. There were a lot of kinds of rare stones, stuffed exotic animals, Buddhist idols and anatomical preparations. Peter I liked to travel abroad and round Russia and often brought back different exotic things. He kept those things in his Summer Palace. The collection grew very quickly, because not only Peter I brought such things and he ordered his people to bring different rarities from everywhere. Peter I started a museum for his collection in the Kikin’s Mansion. But this mansion was far away from the centre of the city and Peter I decided to place the museum somewhere closer. 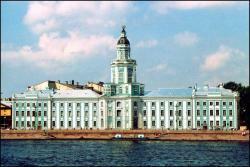 In 1727, when the new building in Vasilievsky Island for his museum wasn’t yet finished the collections of na­tural sciences founded by Peter I were transfered from the Kikin’s Mansion. Until the late 18th century this building was the seat of the Academy of Sciences. Mikhail Lomonosov was the founded of the Academy. From 1741 to 1765, the great Russian scientist worked there. The museum of Mikhail Lomonosov is located there and consist of the following sections: The Life and Scientific Activity of Lomonosov, Lomonosov and 18th- century Russian Astronomy, the Great Academic Globe. Besides Lomonosov such prominent scientists as L. Euler, D. Bernulli and G. V. Richter worked there. This building housed the country’s first public library and observatory of the Academy of Sciences. In 1836, on the base of the Kunstkammer collection several Academic museums were created. In 1878 the Peter the Great Museum of Anthropolo­gy and Ethnography was formed. Its collections are dedicated to everyday life and culture of the peoples of the world. The expositions demonstrate the traditional culture and way of life of the peoples of Africa, America and Asia, their musical instruments and the attributes of secret cults.